This is a book I’ve been interested in reading for years, but somehow I only just got to it recently. It tells the story of two sisters, one dead, one still living and wracked with guilt over their troubled relationship. Jane is the girl who died, hit by a car while she was crossing the road without paying attention. Jane had severe mental health issues when she was alive, her exact diagnosis is left ambiguous but I got the feeling she had Schizophrenia. Her behavior was frequently self-absorbed and erratic and she was constantly frustrated and jealous of what Lily was able to have for herself- a normal life, a boyfriend, and friends who helped her feel less alone. As you can imagine, Jane’s destructive behavior was hard on Lily and their family, and Lily and Jane go from being very close as children to distant and resentful of each other as teens. First of all, I like the way the author portrays Jane’s transitional period to her final afterlife, living in an otherworldly version of her grandparent’s house and being able to essentially relive the same day with them over and over until she’s ready to let go. I felt that it was all pretty unique and even though I don’t believe in life after death Griffin made it strangely believable, something I was able to buy. I almost forgot that she was portraying something that wasn’t realistic, because of how level-headed and matter-of-fact it seemed. Throughout the novel I often found Jane a fairly difficult character to like. There were several moments where I felt a lot of compassion for her, and overall I felt like I was able to understand why she was the way she was. On the other hand, I had the feeling that Lily was supposed to be easier for readers to relate to than Jane, but I honestly felt her character was kind of bland. Whereas Jane was a mentally unstable loner, Lily seemed like a somewhat generic portrayal of a typical teenage girl. Jane has a much more distinct personality and seems infinitely more interesting than her grieving sister. I liked the way they handled the ambiguity of Lily and Jane’s relationship, and how Lily often felt exhausted with Jane and found her difficult to love unconditionally. Even though the accident wasn’t Lily’s fault, she feels like she’s somehow responsible for not being able to save Jane. This felt realistic to me and I liked how not everything about the girls’ relationship was black and white. Where I Want to Be was a quick read and I found it to be compelling and enjoyable throughout. It was a pretty sad novel but not overwhelmingly so, it made me feel emotional at times but it didn’t wreck my entire day. I felt like it was a book that contained a lot of hope that ultimately overpowered it’s more downbeat qualities. 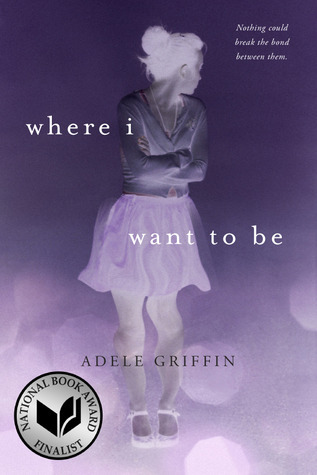 After I finished it, I added multiple Adele Griffin novels to my to-read list. I hope I will end up liking them as much as I liked this one.